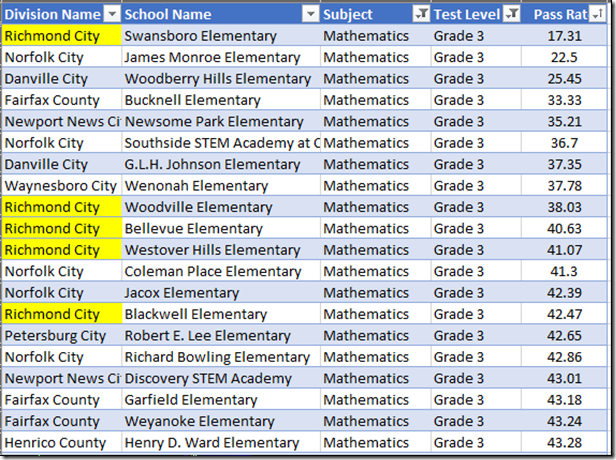 The earlier post shows that, despite the happy aura, Westover Hills Elementary School is miserably failing to educate its students. 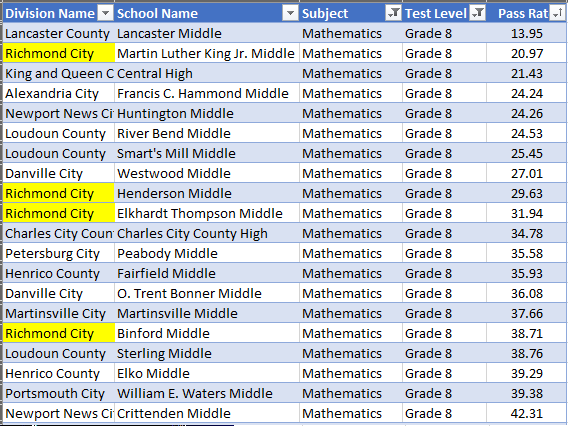 I singled that school out because of the story in the paper, not because it is the worst performer in town. 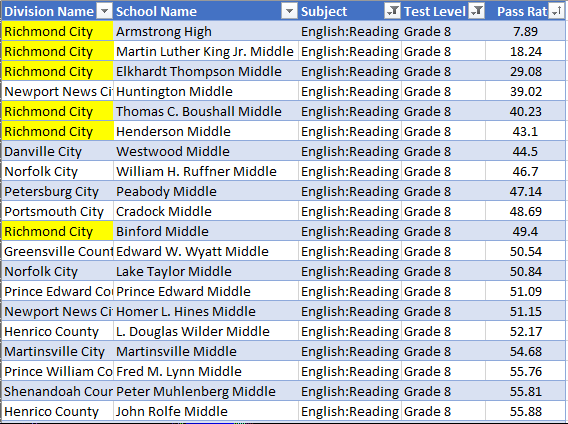 It merely is among the worst. 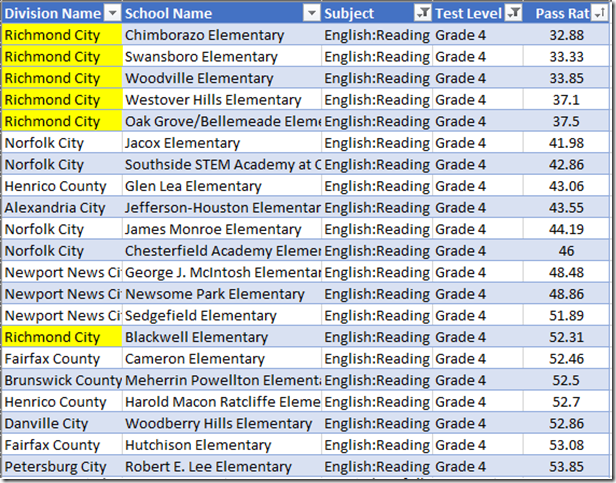 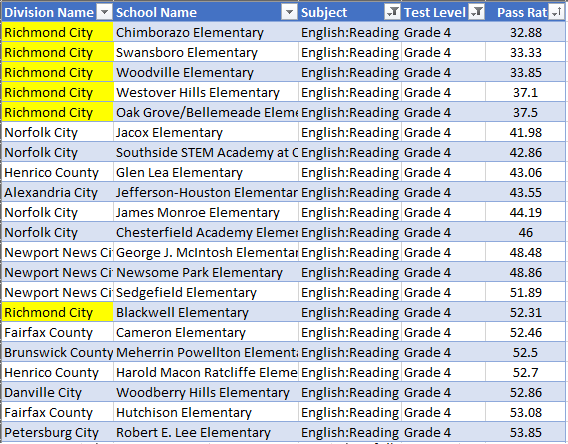 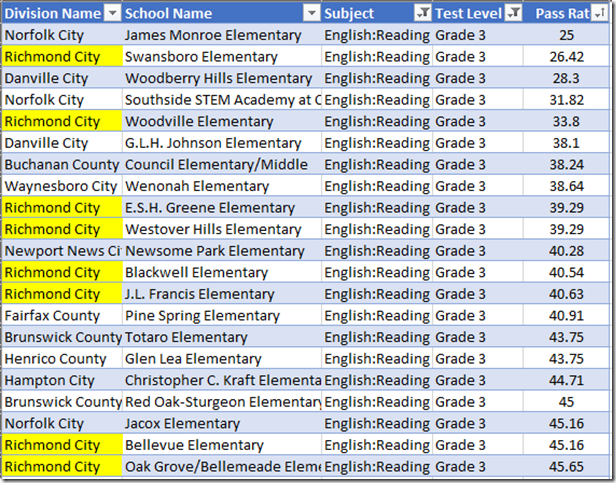 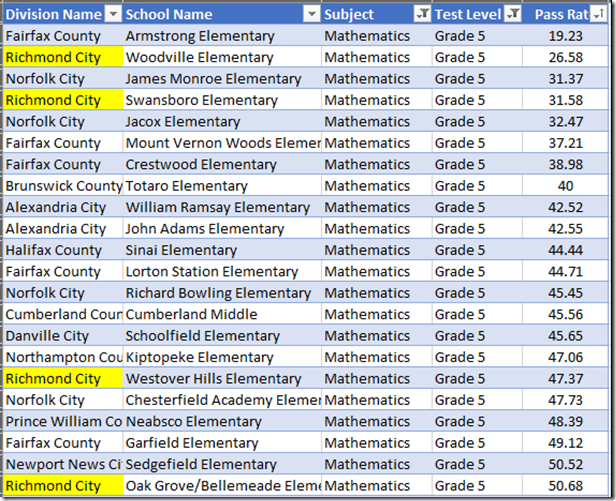 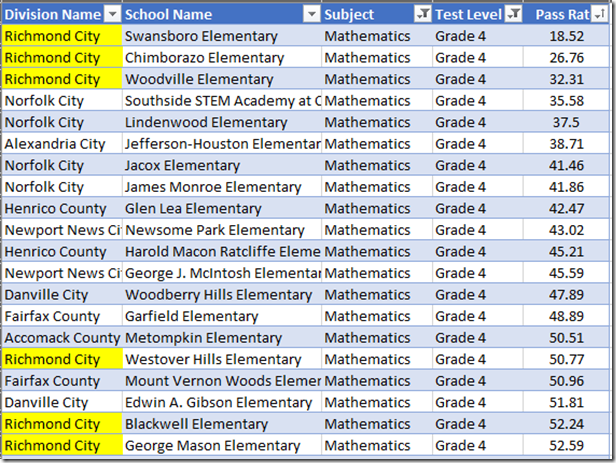 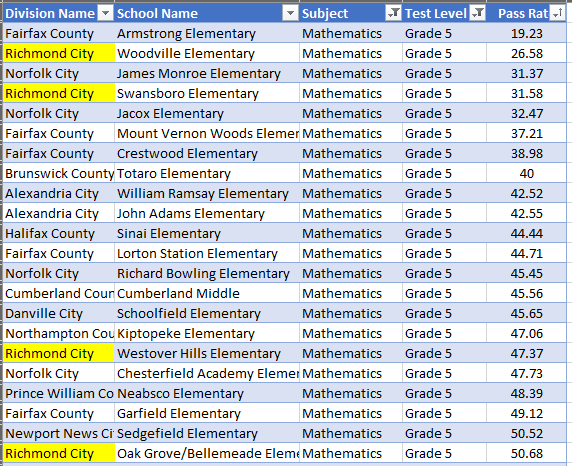 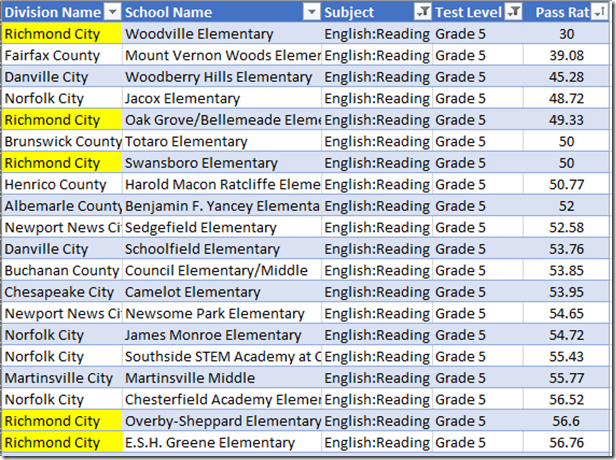 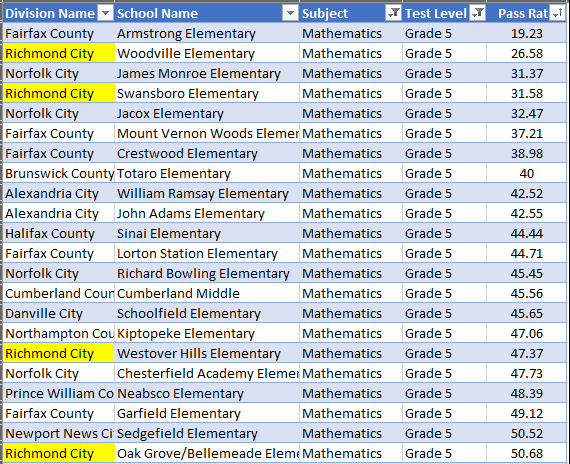 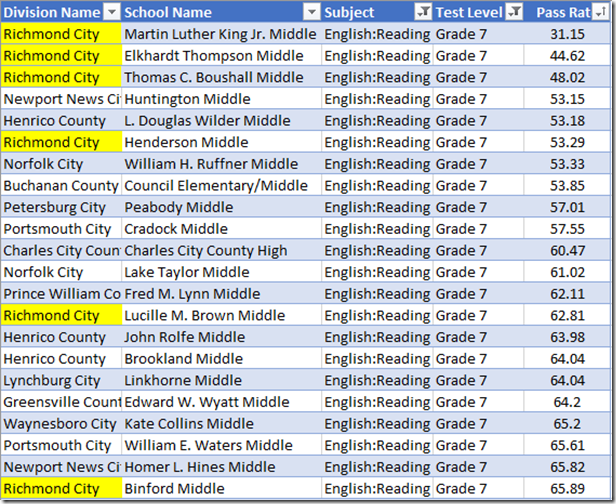 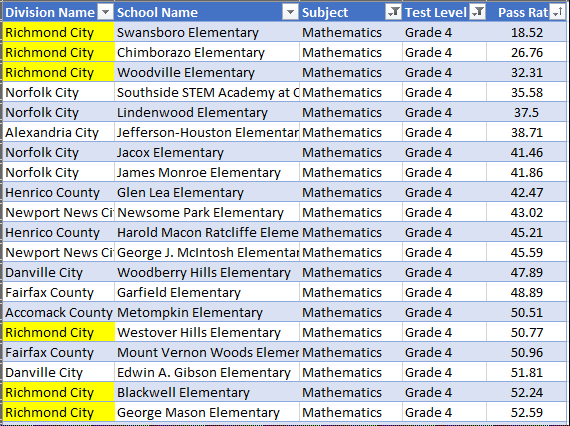 For example, here from the 2017 testing are the twenty-one worst 3d grade reading pass rates in Virginia. 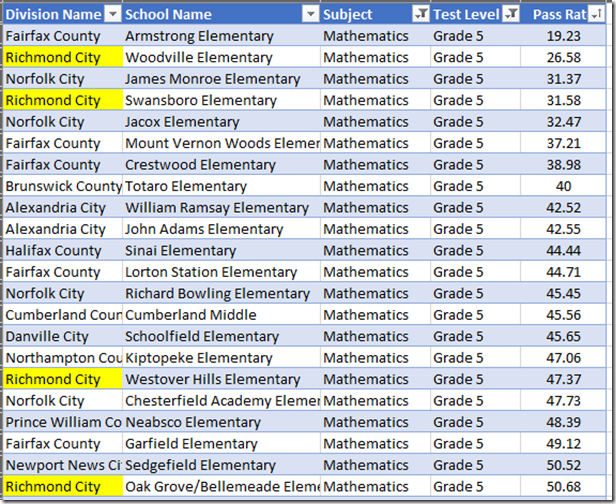 For reference, the accreditation benchmark is 75%. 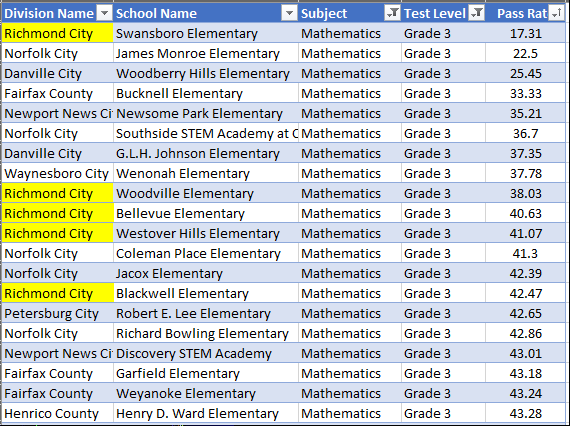 Westover Hills’ 39.3% ties for ninth from the worst. 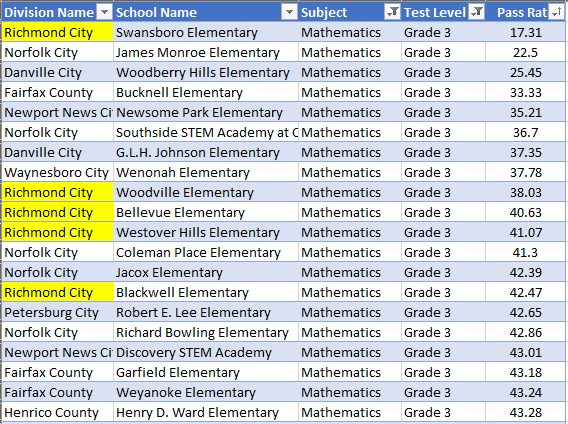 Seven other Richmond elementary schools join Westover Hills in this cellar. 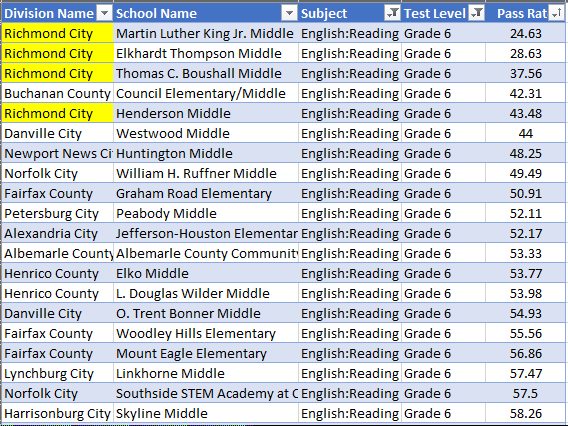 It’s a secret pleasure to see a school each from Fairfax and Henrico on this list. 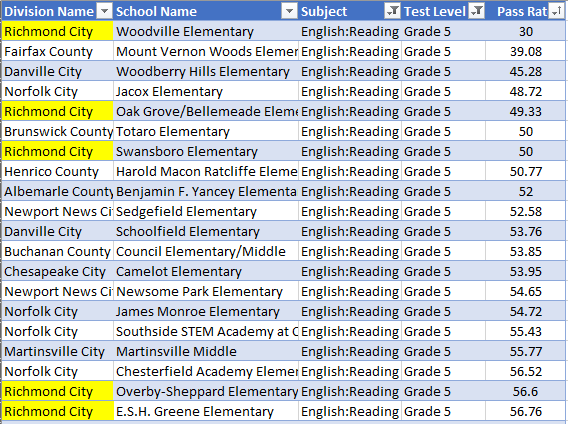 That said, these data tell us that terrible schools are not unique to Richmond, but the concentration of them is. 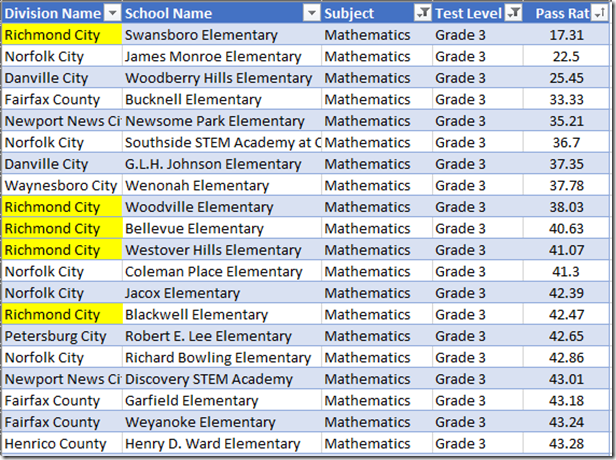 Notice that Westover Hills’ 5th grade performance floated above the bottom of the barrel. 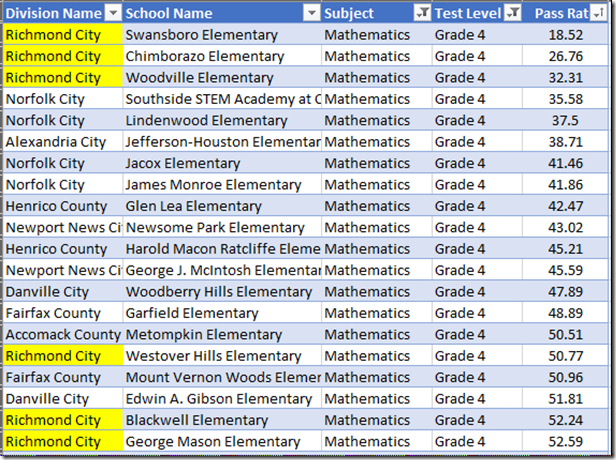 The math picture is similarly awful. 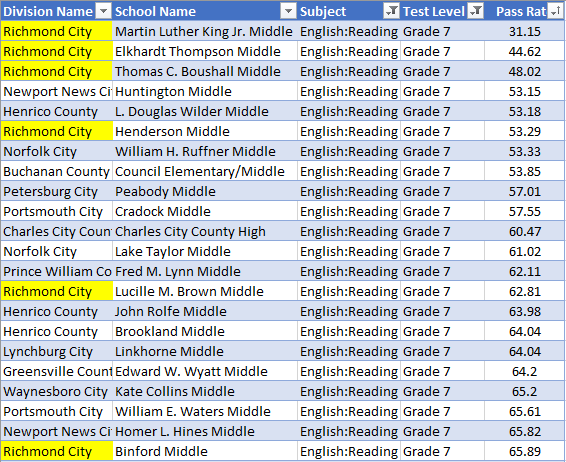 The middle school numbers are no more encouraging, especially in light of MLK’s successful candidacy for worst in the state. 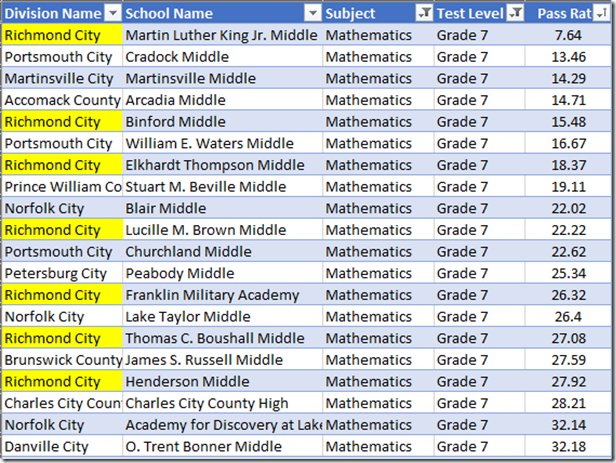 This 7th grade list expands to 22 schools in order in order to include Binford. 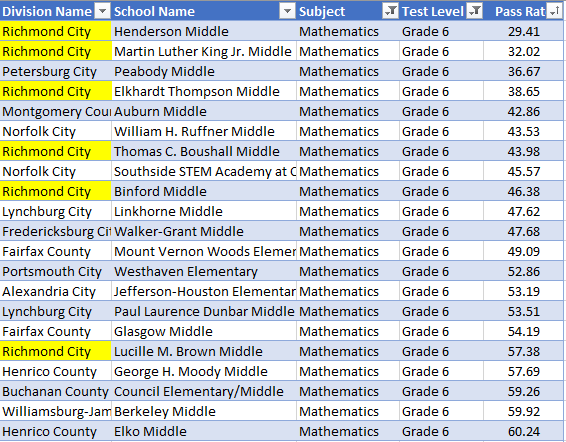 Of Richmond’s seven middle schools, all but Albert Hill made this expanded list. 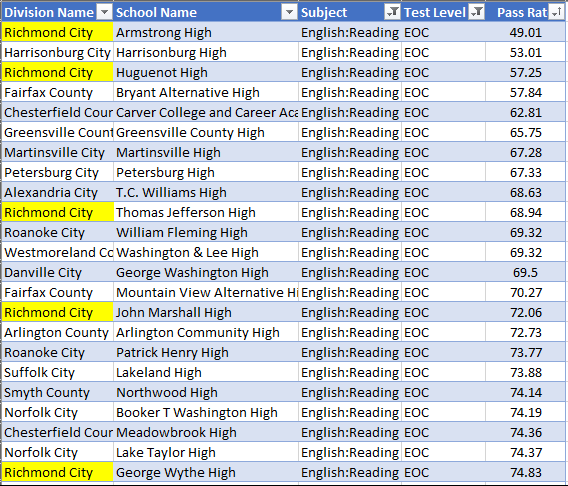 All of Richmond’s mainstream high schools made the bottom 23. 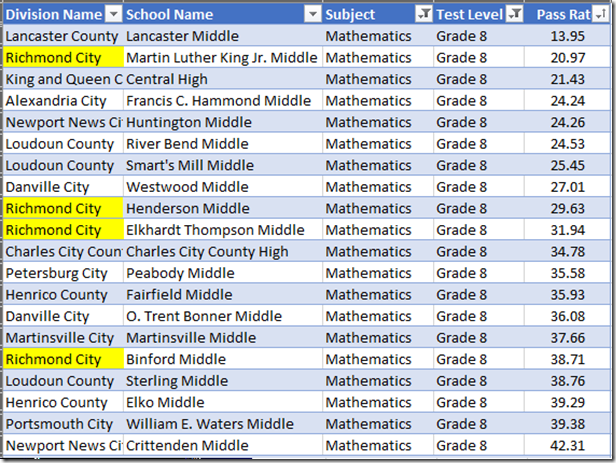 In a happy contrast, both of the more selective high schools aced the reading tests (Franklin, which is selective and has both middle- and high school grades, also did just fine, with a 93.9% pass rate). 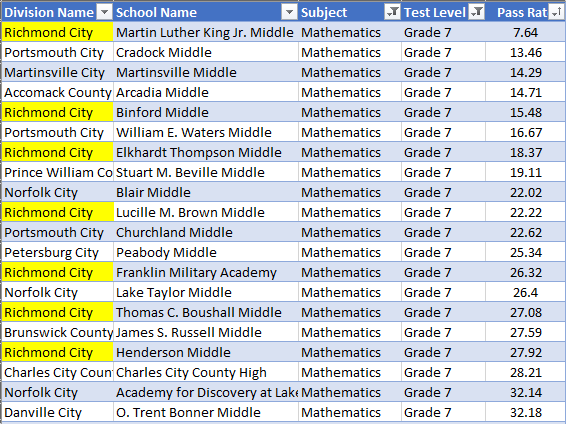 The only surprise in the middle school math data is the (slight) competition for MLK in the race to the bottom. 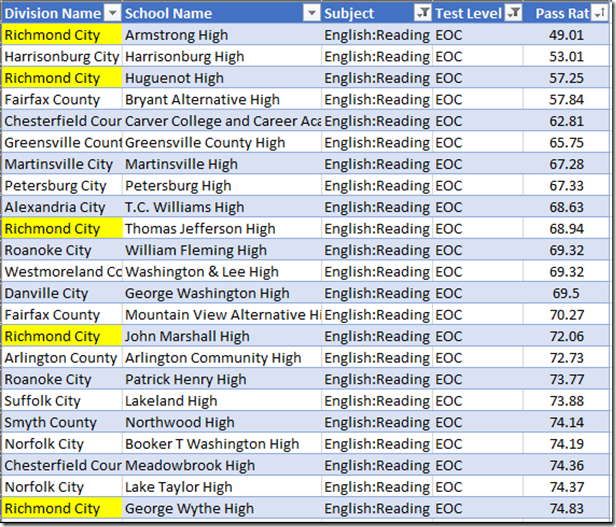 As to the mainstream high schools, Huguenot floats out of the cellar. 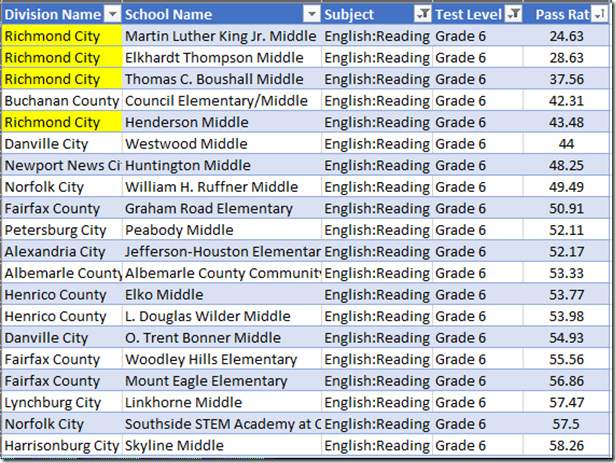 Franklin (which is selective), replaces Huguenot. 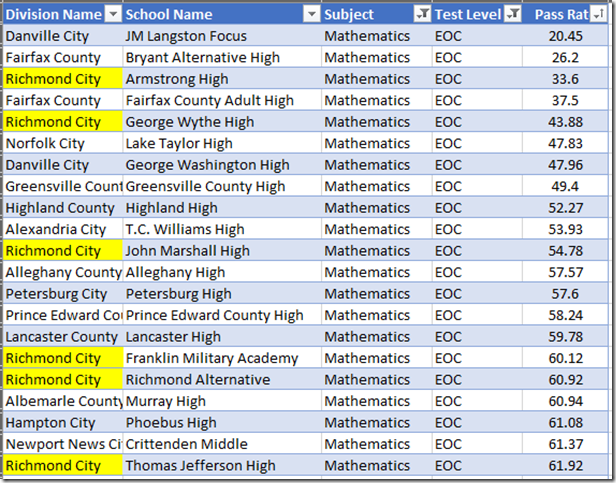 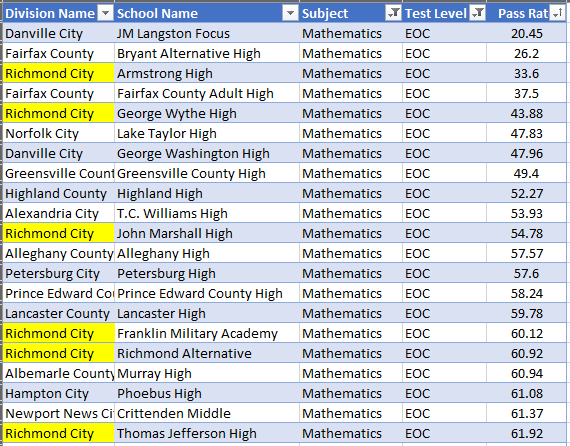 Neither of Richmond’s selective high schools appears near the top of the math EOC list. 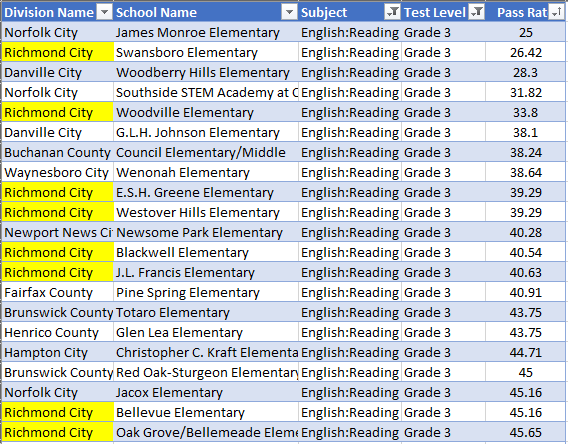 Open High is no. 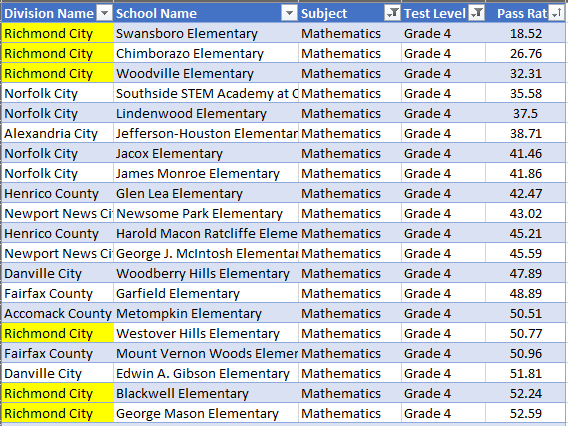 178 from the top with a 98.1% ; Community is 611 at 67.9%, behind Huguenot at 579, 72.1%. 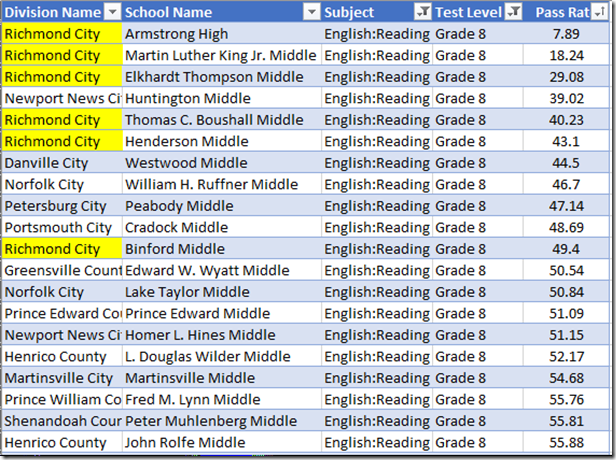 Welcome to Richmond, Mr. Kamras.